TOG’s drill batteries were on their last legs. We were barely getting a few minutes of use after a charge. Time for some new batteries. Two new batteries were almost the price of a new drill, so we looked at buying a brand new drill. There was nothing wrong with the old drill …. just that the batteries were bad. 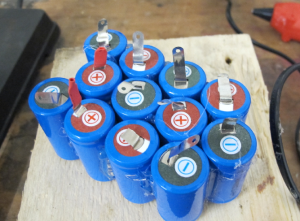 After a bit of searching on the ‘net, a set of 12 new cells was on its way to TOG for just €15. The battery pack was opened up and the old cells removed. The new cells were fitted with the same layout. Lots of pics here. After reassembly, the battery charged fine and the drill is back in action. Just need to do the second battery now. This was written by gary. Posted on Friday, May 29, 2015, at 10:26 pm. Filed under Tools, Workshops/Events. Bookmark the permalink. Follow comments here with the RSS feed. Post a comment or leave a trackback. Where did you get those cells from at that price? We’re rebuilding the second battery at the moment.